Connor Currie, 16, from the Dungannon area, who died after events at the St Patrick's Day disco. Connor’s funeral took place today in Saint Malachy’s Church, Edendork at 2pm. 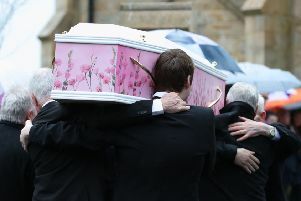 As the Mass began, items to remember Connor’s life were brought forward. Connor’s mother and father, Ciara and Eamon, and his brothers Sean, Cormac and Cahir presented a family photograph, a Saint Patrick’s Academy blazer, an Edendork football club jersey, Connor’s football boots and a football trophy. The first reading was from Ecclesiastes 3:1-8: “For everything there is a reason, and a time for every matter under heaven; A time to be born and a time to die; A time to plant, and a time to pluck up what is planted; A time to kill and a time to heal; A time to break down and a time to build up; A time to weep, and a time to laugh; A time to mourn and a time to dance...”. In his homily, Father Donaghy said that Connor’s neat and tidy bedroom reflected the fact that he was hoping to become an accountant. He said: “The readings we have just listened to bear a strong resonance with the life of Connor Currie. The first reading lists a whole series of emotions and experiences, positive ones, negative ones and even neutral ones. Thankfully Connor lived through a lot of the more positive experiences: he knew an abundance of times to laugh and even some times to dance; over the years of his young life there was a lot of time to build up his academic success and his sporting skill; plenty of time to keep in his memories of good times with family and friends – treasured times together. Most of all Connor knew a great amount of time to love and to be loved, most especially within his own family where despite his young age he had a remarkable capacity to look after his younger brothers Sean, Cormac and Cahir: so much so that he could be left to look after them and even prepare food for them when their parents went shopping or on some short trip. “The times with Connor were good times. In recent days Connor’s parents and close family have been greatly comforted by the good memories shared with them by Connor’s classmates and team-mates and teachers and friends. Friends have recalled how he lit up a room as he entered it and his infectious smile warmed everyone’s hearts. Teachers remember him as a courteous and appreciative young student, always in the habit of saying thank you as he left the classroom - though he maybe let that be the passport that got him through an odd bit of mischief as well! “At home that ‘thank you’ was a constant habit as well - he always spoke those words as he left the kitchen table. Unlike the usual reputation of teenage boys he was quite fussy about the tidiness of his room, the wardrobe hangers well used and clothes neatly folded in the drawer, no clutter in the room and everything in its place. He knew he was loved at home – as his parents said to me ‘he was a gem’. Away from home he was a star as well, a conscientious student who had his sights set on doing accountancy, the office desk and computer set-up in his bedroom a sure sign that he was preparing for a life of paperwork, computers and figures. 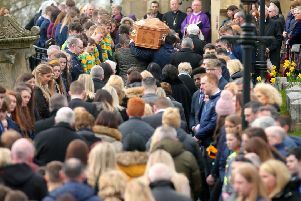 “He was a star on the football field as well - the trophy brought up at the start of the Mass just one token of the commitment and skills he was developing. And there’s always bits of a teenager’s life that the parents don’t get to see, so it has only been in the last few days that Connor’s friends shared with his parents some video shots on their phones of Connor practising his dance moves – and improving those skills as well! “There’s a thing too about Connor that maybe his friends didn’t know - he was actually born in Armagh and lived in Portadown until he was about seven years old. He recently went to the McKenna Cup Final with his Tyrone top on but before leaving he let his Armagh-born mother have a peep to see that he had an Armagh top on underneath the Tyrone one - Connor was going to be a winner either way! “And a winner indeed he was: a winner of a loving family; a winner of many loyal friends and team-mates; a winner in school life and on the sports field - and a winner above all, of a place among the ranks of God’s children. Connor happily shared in the faith of his family, the loyal and sincere faith passed down through the generations. So we can indeed, in the words of the second reading, “think of the love that the Father has lavished on us, by letting us be called God’s children”. Connor as a child of God is drawn in trust and faith into the eternal company of heaven. “For us, of course, he is gone all-too-soon, but we listen to the promise of Jesus in the gospel that He goes ahead of his faithful people to prepare a place in the everlasting peace of heaven. God opens His arms in welcome to Connor. May his kind soul find eternal rest in the happiness of our eternal home. And here life starts anew”. Archbishop Eamon Martin, in his final commendation, likened the sudden tragic death of Connor of St Patrick’s Day to that of the saint himself, who was abducted from his own family. “The young teenager, Saint Patrick, in the depth of his pain and isolation, wrapped himself around with prayer: “Christ on my right, Christ on my left”, he prayed. “Christ in mouth of friend and stranger”.